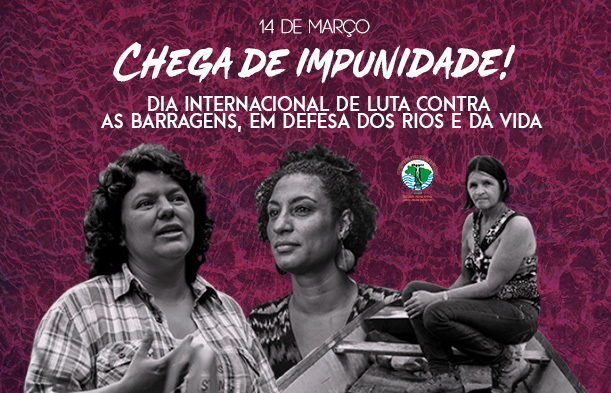 From March 8 to March 15, 2019, hundreds of actions were carried out globally to commemorate the “International Day of Women”; on this day, women from the countryside and the city denounced the structural violence of capitalism and patriarchy by organising marches, land seizures, fairs, debates, training and more. 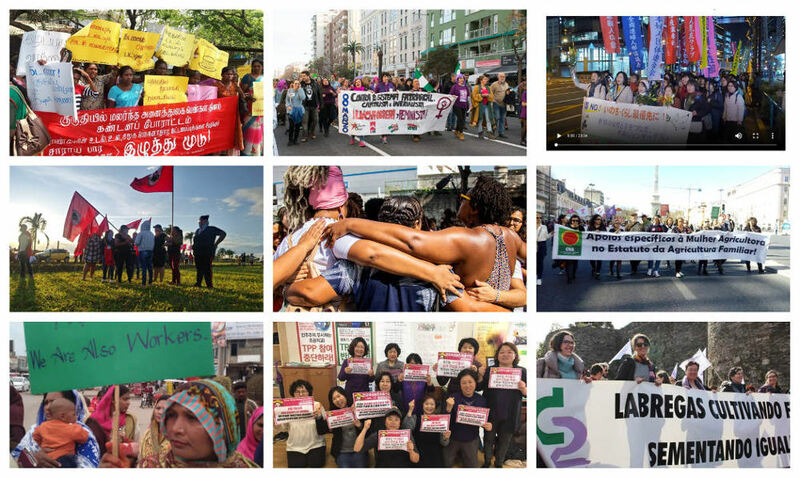 With the slogan ‘For the life and dignity of women, we fight together against the exploitation and oppression of the capitalist and patriarchal system!’, the international peasant movement, La Via Campesina had called upon its members and allies to unify actions of struggle and resistances around the world. “We remain steadfast in our mission to germinate hope and liberation for women around the world. 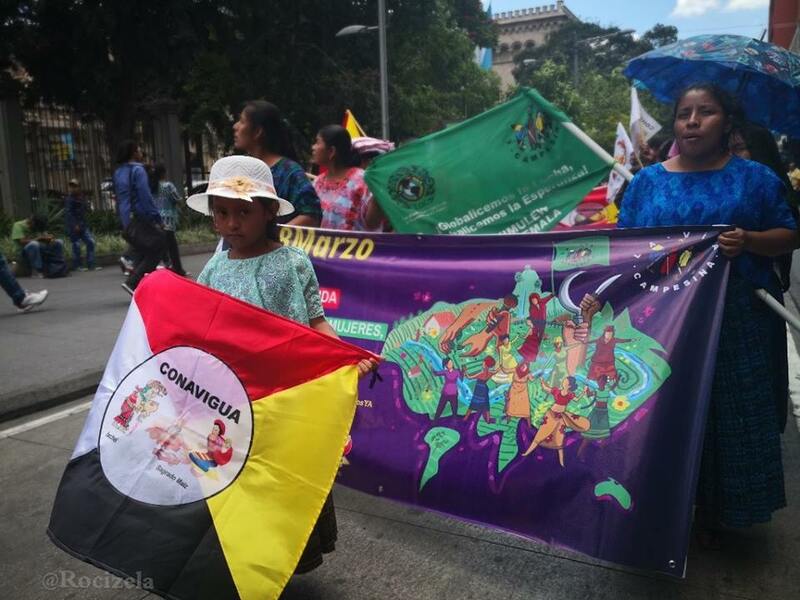 And that’s why we sister in a fraternal way with all the women in the International Women’s Strike, who sought to demonstrate that women’s work is a key factor in sustaining and reproducing life and the global economy.” read the press release from La Via Campesina. “Only with social organization, with formation and political study and in unity with other feminist organizations of women and workers, will we be able to advance in a dignified life for women and men”, read the release. In Brazil, there were pdemonstrations by women all over the country; in São Paulo, 50,000 women gathered on Paulista Avenue. There were also important mobilizations in Porto Alegre, Rio de Janeiro, Recife, Fortaleza, Salvador. Under the slogan “For the life of women, we are all Marielle”, thousands of women took to the streets to protest against the dismantling of Social Security, the increase in feminicide and the setbacks of the Bolsonaro government, in addition to celebrating the legacy of feminist activist Marielle Franco. 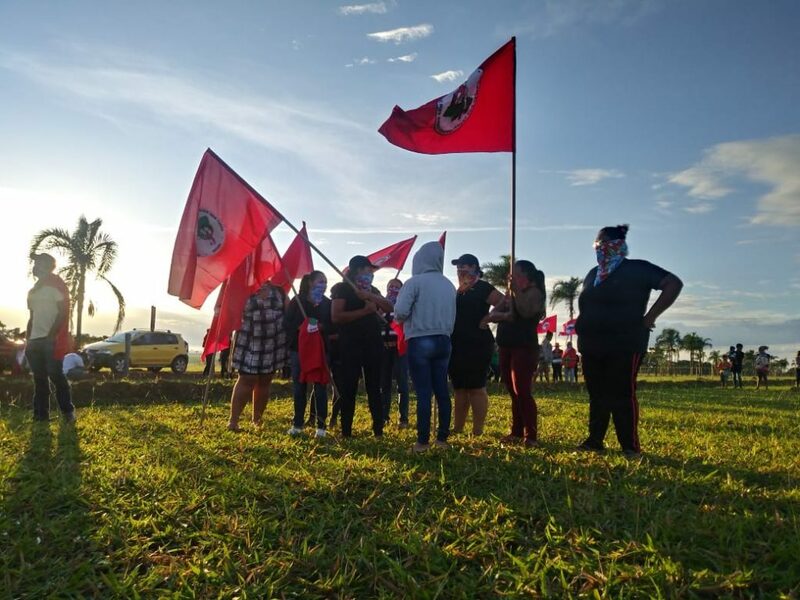 On March 14, 2019, on the day Marielle’s murder celebrated a year of impunity, the women of the Movement of Landless Rural Workers, MST, and the National Movement for Sovereignty in Mining, MAM, paid tribute to the memory of this fighter. 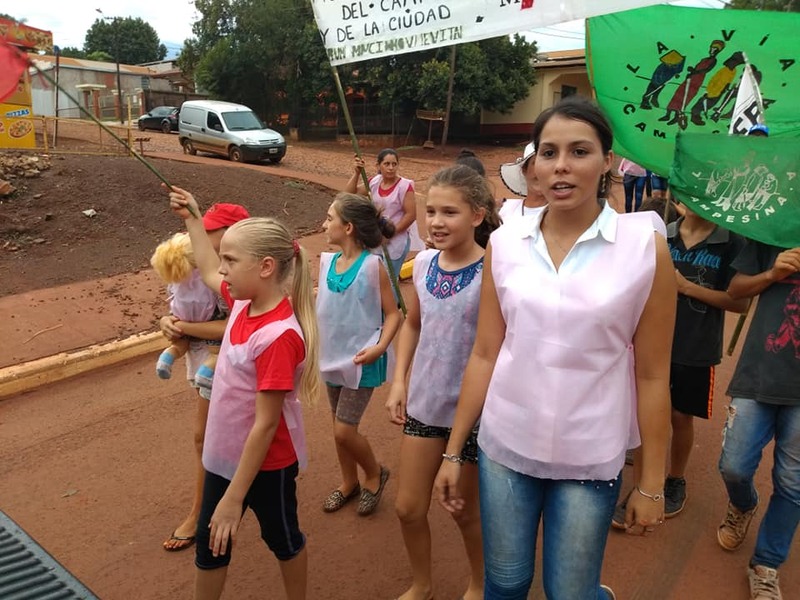 They carried out a blockade of the rails and stopped the cargo train of mining giant Vale, denouncing the social and environmental crimes in Mariana and Brumadinho, in the state of Mina Gerais. “We want people to understand that the problem is not the dams, but the model of mining and exploitation, which gives everything abroad, mainly to China, for its benefit. 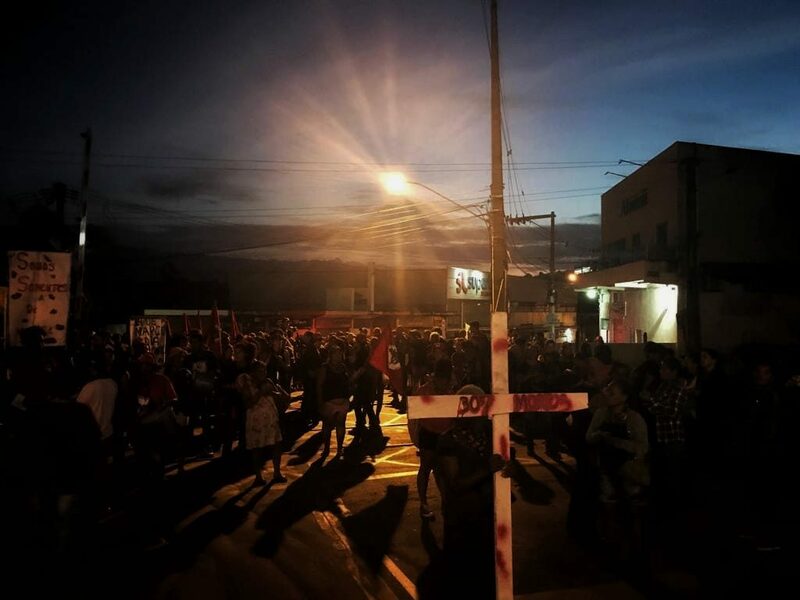 Brazil is left with precarious work, contamination, mud and lack of water,” denounced Maria Julia, of the National Movement for Sovereignty in Mining. For their part, women in Honduras took direct action against the Ministry of Justice, in that country where more than 6,000 people have been prosecuted for conflicts related to access to land. It is estimated that 1700 of these prisoners are women. The organizations denounced the alarming criminalization that has its most atrocious expression in the murders. In the last 9 years, around 120 agrarian and peasant activists have been murdered for defending their lands. Most of the cases remain unpunished. “No more violence or criminalization against women defending their rights in the countryside”, the women who gathered had affirmed, using images of slain human rights activist Berta Cáceres. In Colombia, a territory riddled with violence and persecution, women from the National Agrarian Coordinator, CNA, held a meeting in Cauca. In this space, the women demanded that the genocide and the judicial processes against popular, indigenous, peasant and peasant leaders must stop; and that defending life, peace and territory should not mean death and exile, or jail, but rather, on the contrary, that it gives rise to social and political recognition as a citizen of a country that is moving towards democracy. In the main streets of central Guatemala as well, the voice of women was heard demanding justice from the authorities for thousands of women whose lives have been taken, and many of the cases remain unpunished. In this country, according to data from the Public Ministry until November 2018, the average number of women per day was 119, who were victims of some type of physical, economic, psychological and sexual violence. 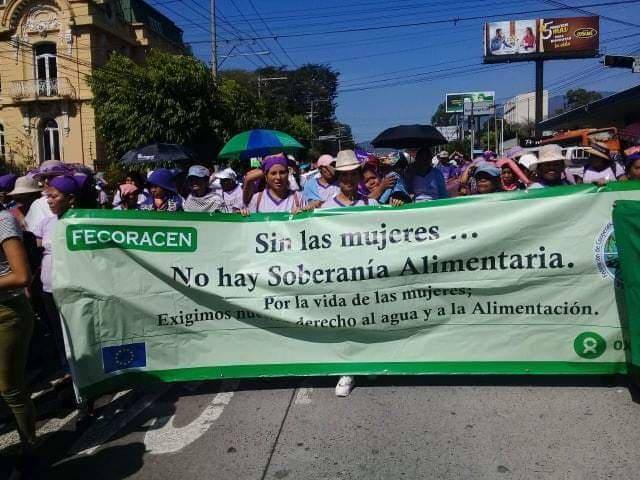 In El Salvador, on March 8, feminists, members of the National Health Forum, the Women’s International Democratic Federation and La Via Campesina of El Salvador took to the streets and marched together to demand their right to live free from all forms of discrimination and violence. “Women and girls continue to face high levels of gender-based violence. According to the violence survey, 7 out of 10 women in El Salvador have had at least one situation of violence in their lives,” they said in their statement. So far this year 59 women have been murdered in the country, and in 2018 there were 2203 reports of sexual violence, mostly against girls and young women. 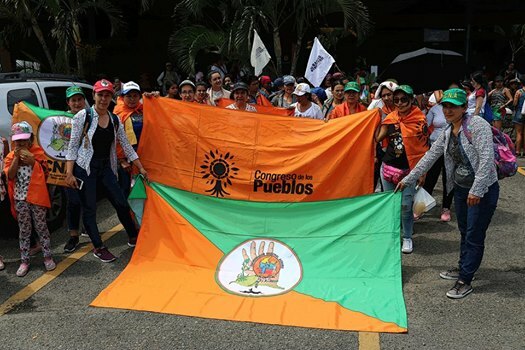 Likewise, the National Federation of Peasant, Artisan, Indigenous, Native and Salaried Women of Peru, FENMUCARINAP, participated in a banderolazo outside the Ministry of Labour in Lima to denounce the precariousness of peasant women’s rights. While in the Dominican Republic this day was received with political and legislative setbacks, as well as serious violations of our human rights. “In this place we are more than 5 million women, we are more than half the population, we are citizens who, with our work, with our strength, with our body, with our life we make this country great and honorable. However, our history is neither recognized nor told,” they concluded. In Argentina large marches were registered, the struggle against the legalization of abortion is a flag within the feminist movement of the cities and the countryside, green scarves gain more followers on a global scale. The Movimiento Nacional Campesino Indígena, MNCI, also carried out actions in Buenos Aires, the compañeras of the Esteban Echeverria neighborhood build popular feminism where the government adjusts with more brutality. In Jujuy, talks-debates and recreational activities were held with peasant women. Likewise, indigenous peasant women from the countryside and other neighborhoods of Santiago del Estero convened at the sports center to exchange about their struggles and challenges as women struggling against patriarchy and what is meant by Peasant and Popular Feminism. In Mendoza thousands of peasant women also stopped. There were powerful mobilizations, in cities like Bilbao, Barcelona, Istanbul, Paris as well. In Lugo, Spain, the women of the Sindicato Labrego Gallego took to the streets together with allies, highlighting the importance of sharing their perspective as women and as peasants, two sectors traditionally discriminated against. Thus, María Ferreiro explained that the #8Marzo “was linked to the labor, care and consumer strike”, three very central issues on the union’s agenda. 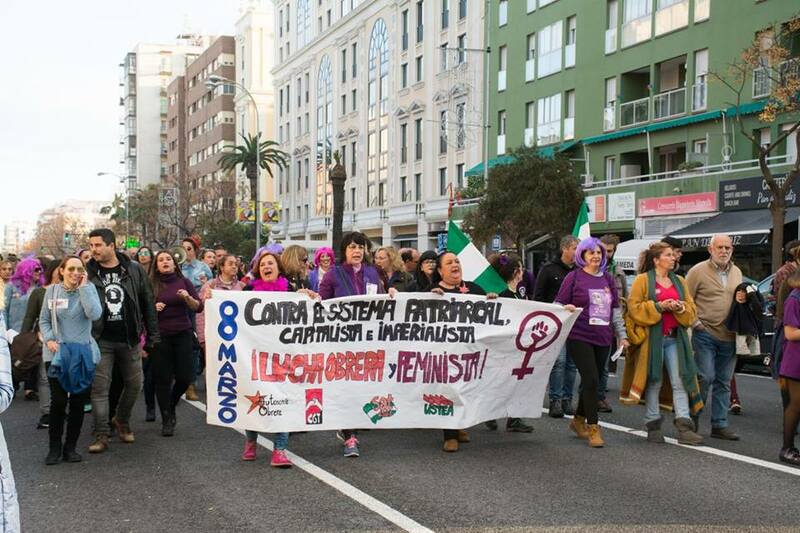 The Andalusian Union of Workers, SOC – SAT also carried out several actions in Andalusia, the day of feminist and class struggle encourages us to continue weaving networks of resistance from the working classes, and to continue working side by side with other grassroots organizations and unions, mentioned in their networks. 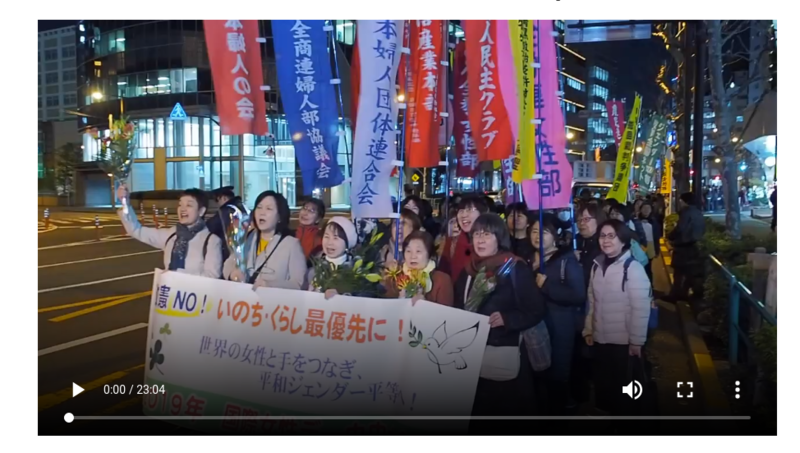 In Japan peasant members of Nouminren joined a march of solidarity outside the Japan Education Centre, also marking the 40th anniversary of the Treaty on Elimination of Discrmination on women. In Timor Leste pesant women from MOKATIL organised a peasant market and displayed messages of solidairty to mark the International Women’s Day. 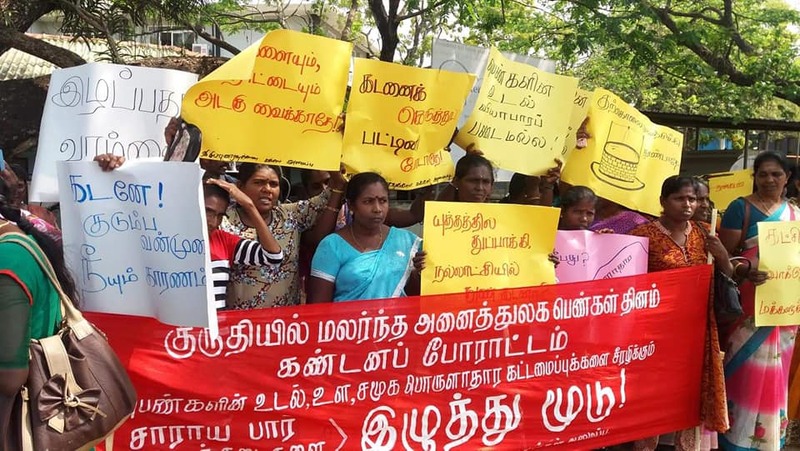 In Srilanka peasant members of MONLAR organised women in a campaign against expolitative micorfinancing businesses that has trapped the communities in deep debts. Several hundred women, among them peasants and rural workers demonstraed in Vavuniya, a town in the Northen province of Srilanka. 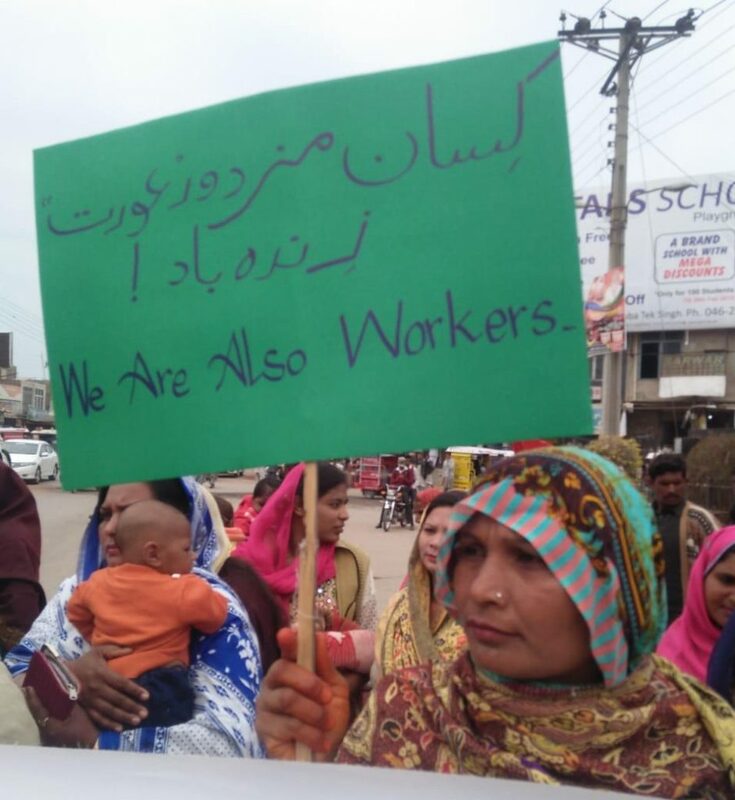 In Pakistan, at the Toba Tek Singh District in the Pakistani province of Punjab, peasant workers and women who work at brick kilns held a solidarity march to mark the day. They remembered Asma Jehangir, Pakistan’s firebrand women’s rights activist and a close ally of the peasant movements, who among many things also helped fight against the criminalisation of peasant movements. 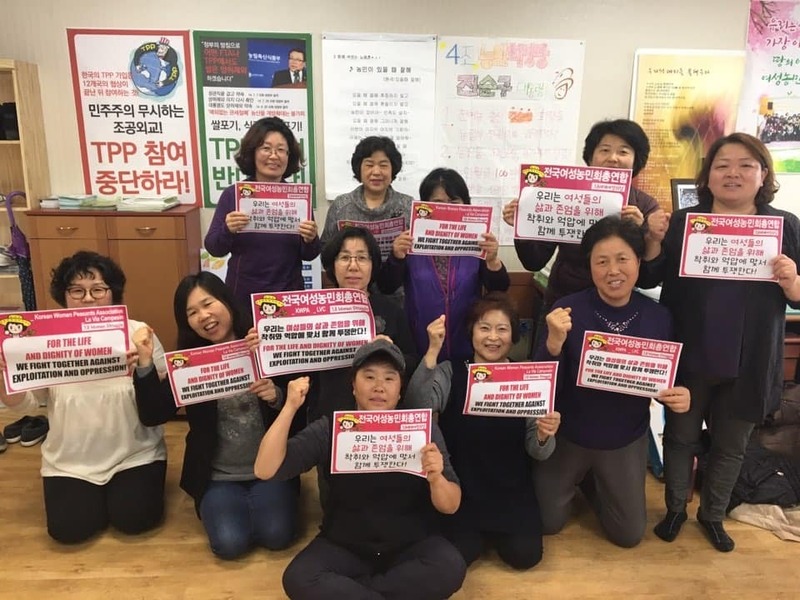 In South Korea, peasant members of the Korean Women Peasant Association (KWPA) organised a Sister’s Feminism Talk, in which activists explained their long struggle against patriarchy, how they carved a space for themselves within the peasant movement in Korea. The Korean Peasant League members also joined in a common action held in Jeju and Seoul. In Canada, the women farmers organised under the National Farmers Union released a press note in which they called for full recognition of women’s work in farming, fishing and pastoral endeavours all over the world as valuable and necessary contributions to society’s well-being. In Tanzania, ESAFF issued a press reléase titled “Standing with disadvantaged rural women small-scale farmers in Uganda” where they called on upon government to ensure an inclusive atmosphere which puts gender equality considerations and voices of women at the forefront of economic empowerment, policy formulation, and climate change management, as this is thee only viable way to achieve a balanced better world. In Palestine women showed their struggle and resistance, about 100 UWAC women from various West Bank villages declared their solidarity with Palestinian women who suffer with their families, daily, the government’s policy of occupation that wants to deport them, destroying and confiscating their farms. 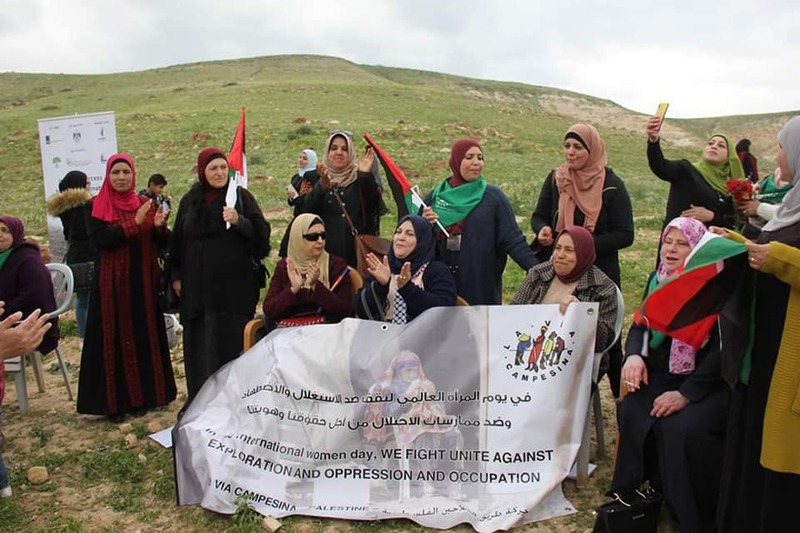 Ahlam Echtiah of the Palestinian CVL said: “The celebration of March 8 in this region is a real celebration of women’s day, together with women who represent an example of resistance to the occupation of their lands”. In Morocco, the organization of women in the agricultural sector, affiliated to the National Federation of the Agricultural Sector, organized meetings on women’s rights. 11 meetings are organized during the month of March in different regions and brought together women from the same activity: peasant women, farm workers, agricultural engineers, rural and urban women. The FNSA women’s organisation also participated in a television debate with a representative of the Moroccan government on the situation of Moroccan farm workers in southern Spain who work in inhuman conditions exposed to sexual harassment, in the indifference and denial of the Moroccan government, which itself organises the travel of these workers to Spain. In Tunisia, the Million Rural Women association, in cooperation with the local branch of the union of workers in the area of “Tuburba” and the regional labor union in the region of “Manouba”, held a mass rally under the slogan “We fight against exploitation, oppression and occupation” attended by a group of women activists and peasants. The rally was characterized as usual with the accuracy and richness of their interventions. The meeting was a tribute to the women peasants and activists from the region of Manouba. In Haiti, the peasant organisation MPA organized meeting on the role of women in creating a more just and equitable society. The women of the MPA recalled the great role played by women in Haiti and around the world in defending dignity and the struggle against exploitation and oppression, in the shadow of a patriarchal and macho system. They confirmed the MPA’s commitment to fight with rural women and women for their full access to natural resources. In Mali, the CNOP, a member organization of Via Campesina, participated in various meetings, including the general assembly of the Kamale communities, which brought together 15 villages in the region. The women of the CNOP met with women customary leaders and shared information on legal and consultation frameworks that guarantee more rights and protection to women, especially in terms of land resources. In France, the Confédération Paysanne reaffirmed, by statement, its struggle for equality between men and women in all fields, the promotion and defence of feminist values and the rejection of gender stereotypes and the patriarchal system. The Confédération Paysanne published a bulletin rich in knowledge for the understanding of the history of feminism, the activity of peasant women in France, the drift from the French language towards the masculine and other articles, with crispy stories on the struggles of the women of the Conf’ and La Via Campesina.